Your Ann Arbor "Bucket List"
You've got lots of great options when you visit Ann Arbor, and here are a few opportunities you'll want to take advantage of. Take a walk in the Arboretum: A natural gem in Ann Arbor, the Nichols Arboretum is the perfect place to get away from the crowds. As part of the university’s bicentennial celebration, the Nichols Arboretum has self-guided walking tours of the “Grandmother Tree Walk” where you can explore some of the historically or horticulturally important trees and their stories. Stop by the Arboretum visitor’s center for a tour brochure. Visit some of Ann Arbor’s favorite restaurants: Have you had breakfast at Angelo's yet? Experienced the 2,147,483,648 combinations at Blimpy Burger? Clapped for the trains as they pass the Gandy Dancer? Discovered your favorite place to dine on Main Street? Tried Zingerman's famous sandwiches? Ann Arbor has numerous restaurants to enjoy and explore during your visits. Be sure to ask what your student’s favorite place is too! Attend a sporting event: Of course, you know about the Big House, but U-M's other sports can be just as much fun and at a fraction of the cost! During spring 2017 commencement weekend, you’ll find that U-M’s women’s softball, women’s lacrosse, and men’s lacrosse teams all have home games. Don’t miss this opportunity to cheer on your Wolverines. Visit the campus museums: Don’t miss the exhibits at the U-M Museum of Art. During commencement weekend you can enjoy the Victors for Art: Michigan’s Alumni Collectors and Constructing Gender: the Origins of Michigan’s Union and League exhibitions as part of the U-M bicentennial, as well as other world-class exhibitions. At the Kelsey Museum, you can discover the Art and Science of Healing and highlights from the permanent collection. And don’t miss your chance to visit the U-M’s Natural History Museum in its current home in the Ruthven Museums Building before it moves to a new building in 2019. Need help finding the museums? The Campus Information Centers' interactive campus map can help. Spin the Cube: Go ahead. We know you want to. 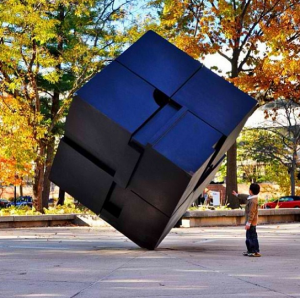 According to university tradition, U-M's president spins this moving sculpture on their way to their office to start the day. Join in the tradition! And if your student is graduating this spring, you'll find that commencement weekend is fabulous!